Brian Dunlop was born in Sydney and studied at the National Art School 1954-59. In 1962 he travelled in southern Europe, and from 1965-68 painted in Rome, Sykros, Majorca, Morocco and London. Dunlop studied etching under Earle Backen and Elizabeth Rooney at East Sydney Technical College after he returned to Australia in 1969. His first prints were of subjects from sketchbooks made while he was in Europe. He was living at Glebe in Sydney when he made 'At Pyrmont'. 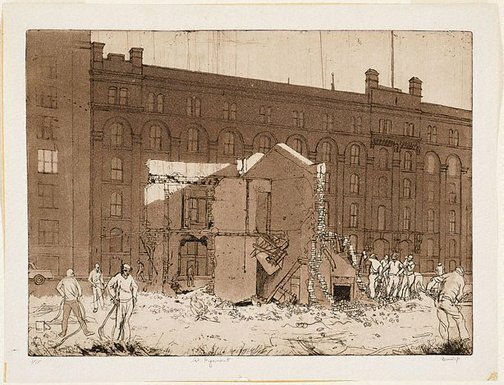 He saw a row of terrace houses being knocked down in front of a large woolstore building, drew the image directly onto the plate and printed it on his own press. Signed l.r., pencil "Dunlop". Not dated.